Committed to innovation, Virospack unveils new proposals every year setting trends in droppers. Take a look! We continously invest in improving our existing references. At the same time as our technical team, working in close collaboration with R&D, achieves innovative developments carried out internally. Virospack develops and produces a big selection of different droppers. Virospack droppers are a market trend in skin care. Virospack has created product lines for box and gift sets for many top global cosmetic companies. Virospack develops and produces stylish droppers which can be decorated using different decoration techniques to offer many looks and personalized finishes. All parts of the spoid can be decorated. Virospack's droppers are an excellent option for cosmetic oils. As oils are increasingly prevalent in cosmetics, the dropper is the ideal packaging for using oils. Virospack introduces droppers for liquid foundation applications. Many brands are betting on this new trend. Virospack's larger capacity dosage droppers are ideal for hair treatments offering a new way of application for the hair market. 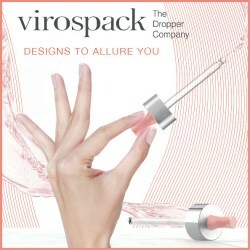 Virospack's droppers can easily be decorated to appeal to male consumers for products which are purely for men. Droppers are the ideal applicator for beard oils as they can target the specific area and be dosed out according to the user's preference. Virospack has released a special line of droppers for nails which includes both droppers for professional nail products and for home use. The award-winning magnetic dropper is a new packaging concept developed entirely by the Virospack team in Barcelona. It is the first dropper on the market with a magnetic closure and perfect sealing feel, benefitting an original bulb dropper with an innovative patented sealing by magnetism system for dropper packs. 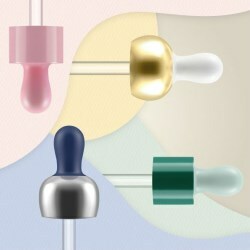 The magnetic dropper is a barrier-breaking concept in packaging, comprised of two pieces; a dropper and a clip on bezel that fits all FEA15 vials on the market. Virospack offers the complete dropper package with tubular glass or moulded glass bottles. Virospack develops and produces a large selection of different droppers which can be decorated using different decoration techniques to offer many looks and personalized finishes. Bobbi Brown's Wrinkle Rescue Kit includes cosmetic dropper and compression cap, produced by Virospack. 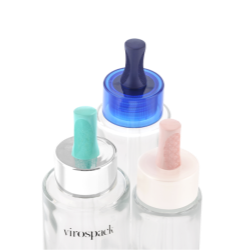 Virospack also produced a full pack with a tubular glass bottle, spray decorated and screen printed, along with a spatula pack and painted cap for the Intensive Skin Serum. For Estée Lauder Advanced Night Repair, Virospack produced a custom metal shell cap which was decorated with screen printing.